Adult Swim’s latest puzzler for the iPhone and iPad, the $3 Girls Like Robots, is just about everything you want in a puzzle game: it’s refreshing, quirky, cheerful, and challenging. Girls Like Robots tells a three-act tale of high school seating arrangement drama. (Because, apparently, that’s a thing.) 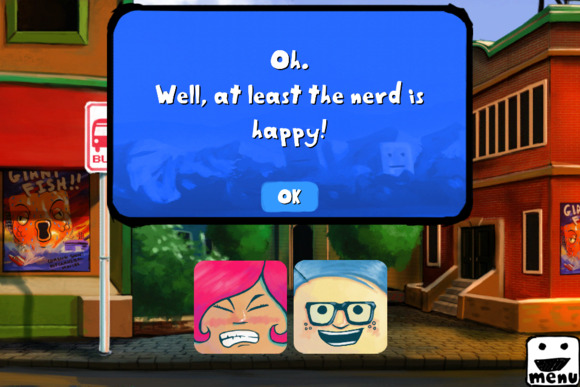 At its core, this game is a logic puzzle: girls like robots and hate nerds. Robots like girls, but not too many girls. Nerds love girls and edges, but hate each other. June likes bugs. Ben likes June. Everybody likes pie, except for robots that don’t understand pie. So who sits where? In each level, the goal is to make everyone as happy as possible. This means putting girls next to robots, nerds next to edges, and people next to pie, and avoiding putting too many nerds next to girls. You can tap and drag tiles with these characters to different slots, or you can tap slots when a pile of tiles is selected (sometimes you have to put tiles down in a certain order). If you make a mistake, you’ll have to hit the undo button and try again. On the left side of the screen, there’s a thermometer that measures the general feeling in the room. Your goal is to fill the thermometer as high as possible—the thermometer has three levels, and filling the thermometer higher results in more points. More points means unlocking bonus rounds, so that’s an incentive to do better. On the right side of the screen are the tiles, as well as a heart icon, which shows you the general relationships between the characters (red = angry, blue = happy). You can also tap on any individual tile to see what that character likes and dislikes, in case you forget. Tile puzzles aside, Girls Like Robots also has a cute, albeit quirky, storyline. I won’t spoil it for you, but it involves situations like Ben falling into the Bug King’s lair, and everyone ending up in a field full of overly friendly cows. The game features an upbeat hoedown soundtrack and several cute cut scenes, which can be skipped if you’re not interested in storyline. Girls Like Robots is a fun, challenging puzzler that’s well worth the $3. My only issue with the game is that you have to undo your last move by pressing the undo button—you can’t just tap and drag tiles off of the board, or to other spaces. It seems like you should be able to do this, and tapping the undo button is unintuitive and frustrating. But I suppose it just makes the game a little more challenging, since you have to plan ahead in order to get the seating chart just right. Girls Like Robots is just about everything you want in a puzzle game: it’s refreshing, quirky, cheerful, and challenging.